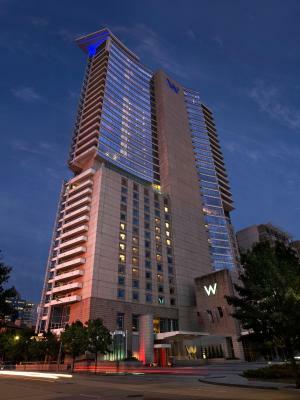 Lock in a great price for W Dallas - Victory – rated 8.5 by recent guests! Bed was super comfortable! Had cake brought up to us to celebrate a birthday which was super thoughtful! From driving up the gentlemen (Valet) were great with any questions we had about the area and directions to where we were going. Friendly, knowledgeable & pleasant to visit with. The hospitality was present through out our stay with any staff members. 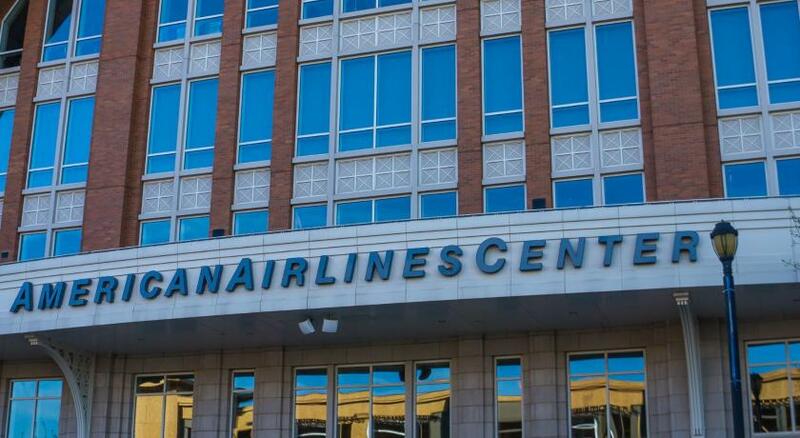 The location of the hotel could not have been any better if you are attending an event at American Airlines Center! Literally steps away from main entrance! Once we parked the car we never got back in it till we were leaving. 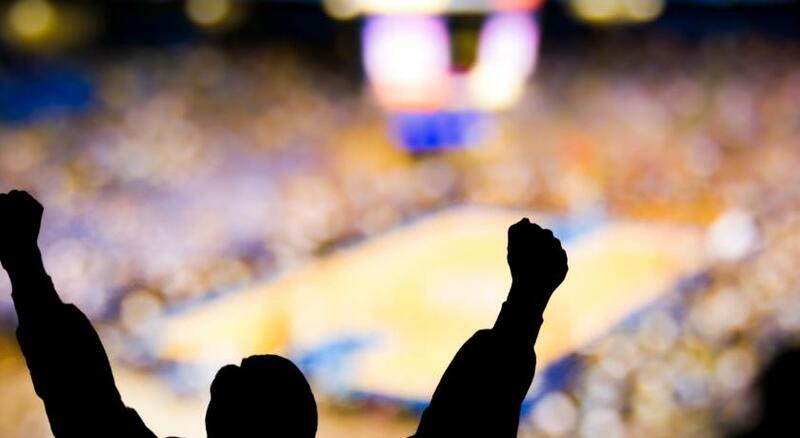 You are within walking distance of a variety of restaurants and just right at the AAC! Great location! Very clean hotel. Friendly and accommodating staff. Good drinks at the bar, and right across the street from American Airlines Center for Dallas Stars/Mavs games or concerts. Called three times for a room service menu , never did get one . The employee told me how busy they were . That's not what I wanted to hear . We never ordered room service . It would have been nice to have a late dinner after watching the hockey game . If your going to American Airlines, it’s literally right next to the hotel, you could walk. It was clean and the staff was friendly and helpful. Literally across the street from American Airlines Center. Easy to get to in that awful Dallas traffic. Close to the fun nightlife - walking distance. W Dallas - Victory This rating is a reflection of how the property compares to the industry standard when it comes to price, facilities and services available. It's based on a self-evaluation by the property. Use this rating to help choose your stay! 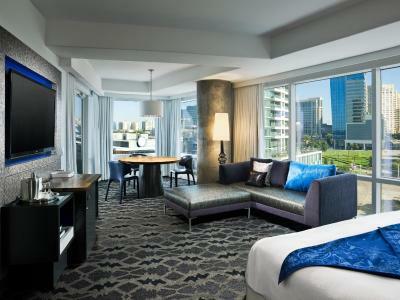 One of our top picks in Dallas.This upscale boutique hotel is in the Victory Park district of Dallas, Texas. A rooftop infinity-edge swimming pool and 24-hour concierge service are featured on site. 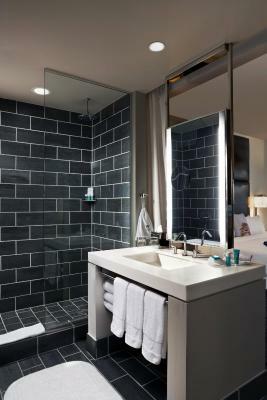 The modern, stylish guest rooms at W Dallas Victory have a 32-inch flat-screen TV, a minibar and a snack box. 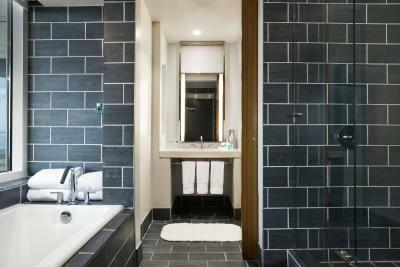 The bathrooms have an overhead shower head and complimentary designer toiletries. Guests can enjoy an effective workout in the 3,000 square-foot fitness center, followed by a relaxing steam at on-site Bliss Spa. A business center with computers, fax and copy services is also available on site. Complimentary car service is available by request and subject to availability. 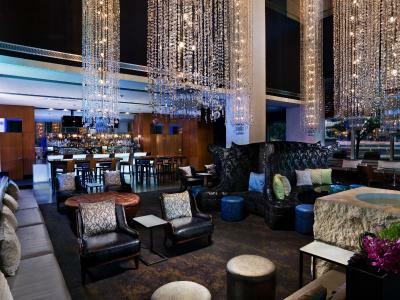 Cook Hall, W Hotel Dallas’s gastro-pub serves classic American fare in a casual environment. Guests can indulge in cocktails, beer, wine and music at Living Room Bar. American Airlines Center and Perot Museum are each within less than one mile of W Dallas. Uptown Dallas is a great choice for travelers interested in restaurants, friendly locals and shopping. 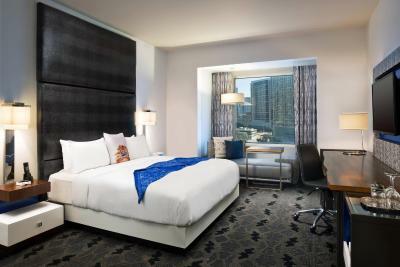 When would you like to stay at W Dallas - Victory? 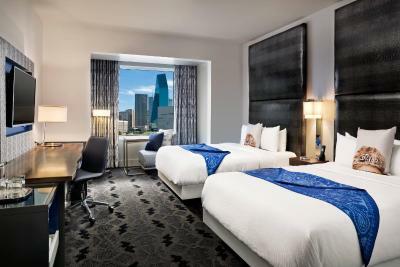 Featuring a separate media room with a flat-panel TV, this spacious suite includes floor-to-ceiling windows with a view of the Dallas skyline. A window-side chaise lounge is also provided. 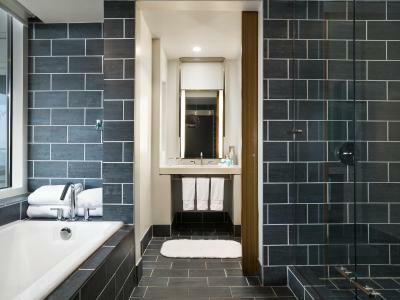 There is an open bathroom with an expanded shower system. Private parking is available on site (reservation is not possible) and costs USD 30 per day. Hotel surroundings – This neighborhood is a great choice for travelers interested in restaurants, friendly locals and shopping – Check location Great location - show map Guests loved walking around the neighborhood! House Rules W Dallas - Victory takes special requests – add in the next step! One older child or adult is charged USD 30 per night when using existing beds. W Dallas - Victory accepts these cards and reserves the right to temporarily hold an amount prior to arrival. The room’s decor was awful. They had a “love box” with condoms and other trinkets for purchase in the room. The carpet on the floor was a pattern of the naked women you find on mud flaps of semi trucks, it was rather disgusting. We found black mold in our shower, and the bed sheets felt like sand paper. Booked room way in advance. Requested and was told a king bed. 2nd honeymoon. Unacceptable. My reservations were canceled. When I checked in. I did not have a reservation. No door on the shower. The bathroom area was wide open to the sleeping area. Had I not gone with my husband it would have been very awkward to be with a friend/coworker. Shower head was great to a point... I took a shower first and if I hadn’t put a bigger towel down on the floor it would have been very slippery and dangerous. Hense the no door issue but someone tall had tilted the shower head which made the water splashing out worse. I was to short to try to straighten it. I felt the pricing was a little to expensive for just a one night stay and by the time the “numerous taxes” they added on it shot the price up even higher than I expected. Just wish they would make it lower in price. One last thing, mirrors!! I understand the purpose of having mirrors around but my goodness you couldn’t tell if it was a door or a wall! EVERYWHERE! Went to a Pink concert. Only complaint was I arrived at check in time of 3pm and had to wait 1 hour and 40 minutes for our room to be ready. We were compensated with vouchers for free drinks and breakfast, so that helped. It was a minor setback, so I’m not dissatisfied. Overall I would stay here again and just delay my check in. Could’ve just been an off day. I loved the service, and the bed. For the price the room was poor and the phone did not work until engineering sent a person to fix on the second day of stay. If I pay $400+ night I expect everything to work and the room to be better than I received. My only complaint was that there wasn’t a comfortable chair to sit on, only the bed or hard desk chair. Valet ran into another car with my car a couple of hours after we dropped it off and checked in. They didn't notify us of the damage until the following day when we checked out. No manager came to talk to us, just the young gentleman working the valet. He advised us that there was an accident, with damage to the front of my car and asked us to fill out a form. No one apologized to us at all or made any attempt to make a very disappointing event any better. Very unfortunate that such a high priced, nice property, does not care more about basic manners and customer service.